Hi, my name is Sophie Scott and I was born and raised in Carlisle. I studied animal management level 2 and 3 at newton Rigg college in Penrith. In the beginning I did well at college earning a distinction and student of the year, but as time went on it got harder and harder for me to keep up with my assignments. When I finished college in June, I did not know what I wanted to do next, but I did know I didn’t want to be in a classroom anymore, I did still want to learn and I thought the best way to do this would be by traveling as I thought that it would show future employers that I am committed, have hands on experience and will through myself out there, unfortunately I would not be able to fund such a long time of traveling by myself. Luckily, I knew about “Everything is Possible” as I went to Aruba to work at the donkey sanctuary for 2 weeks in February 2018 with my collage. 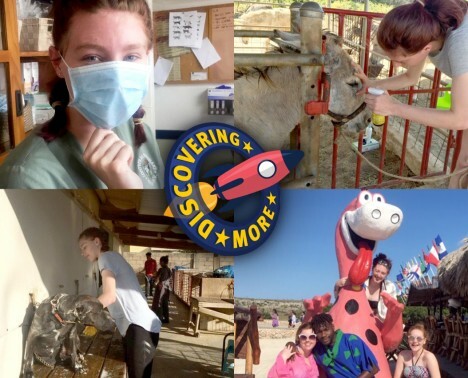 I loved the experience and learned so much, so I decided to contact “Everything is Possible” and see if there would be an opportunity for me to go back and work at the donkey sanctuary and obviously there was as I am now on an 11-month project in Aruba and almost 4 months in! The donkey sanctuary is a charity that opened almost 22 years ago and currently has 130 donkeys in their care, it totally relies on donations to keep the place running and the donkeys fed as the government contributes nothing. I work 4 days a week here. 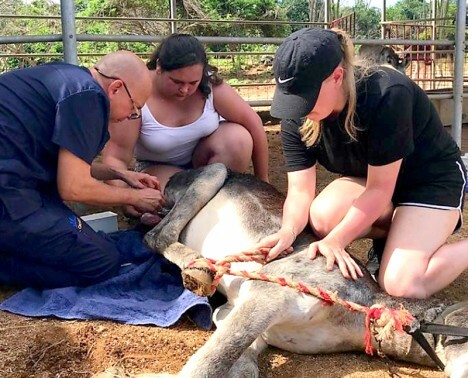 Contreras vets is what it says, it is a veterinary practice that mainly takes care of the island’s cats and dogs, however they will take care of any animal that needs medical treatment and they are also the chosen vets for the donkey sanctuary. I go to work here once every 2 weeks. Dog lovers grooming salon is where locals take their dogs to be pampered and I also work here once every 2 weeks. In the vets first we go and help with consultations which can be for many things from a puppy having its injections to an animal that needs serious medical attention. After the consultations the surgeries begin and we learn about all the different typed of things that can be done from a spay to fixing a broken bone. There are times when we help during the surgeries, do x- rays and ultrasounds. At the dog groomers I mainly wash the dogs and dry them. Then I must clean their ears and cut their nails. I sometimes help when a dog is having its haircut. What do I feel proud of? I feel proud about many things of this experience so far, one definitely is how well I am managing being away from home for so long as I have never lived anywhere else apart from Carlisle. I also feel proud of different situations that I have been thrown in to such and bringing donkeys back to health and caring for them when they have been unwell. I also feel like I have grown as a person and gained more confidence. In my free time I have done many things that have been really good experiences such as gaining my PADI diving qualification which I can use to help regrow dead coral and see the amazing underwater world. I have been on some cultural visits around the island that has allowed me to learn about the island’s history, some of these are the goldmines, natural bridge, local churches, the natural pool, Arikok national park and more but I still have so much more to see. I have also been looking at different things that the local people too such as spending Christmas day with a local family and going to a music concert with them to experience the different music. And of course, I would be lying if I said I haven’t made the most of the amazing beaches here. What have I learned personally? Personally, I have learned so much about myself and how much I should push myself to do things because the outcome is most likely going to be amazing. I have also learned how much I want to work with animals in my future career as the people I work with have so much passion for their work and I want that. One final thing is that sometimes things are out of my control and I can only do my best and be proud of myself in everything I do. What have I learned professionally? I have learned that it is important that you show care and compassion when talking to people about their animals and that the customer is so important to a business or charity because without them it cannot function. I have also learned people can be very passionate about what I am doing as they say to me that I am doing a really great job and they are passionate if I am. How will this experience help me in future life and career? I feel like this experience will help me in many different ways in the future, career wise I think it will show that I am committed, compassionate, that I can talk the talk as well as walk the walk and that I will throw myself in to something 100%. In life I feel like it has shown me that I can do everything for myself and that nobody can stop me from doing something that I am passionate about. It has shown me that sometimes you have to take a risk, not knowing what will happen but can end up being one of the best things that I could do. Hello my name is Caroline Slack, I’m 17 and studying equine management level 3 at Kirklees College. 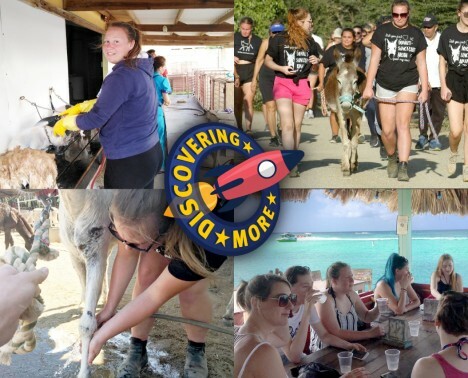 I was given the opportunity to go to Aruba and work with the local donkey sanctuary, vets and dog groomers. When at the sanctuary I fed, generally cared for and preformed medical care on the donkeys. In the free time we explored the local landmarks like natural bridge. Thanks to Erasmus+ I have become more employable in the animal industry due to my new found skills. I have come out of this placement a lot more confident. I can’t recommend this type of experience enough. Hi, my name is Renee Cheytanova. 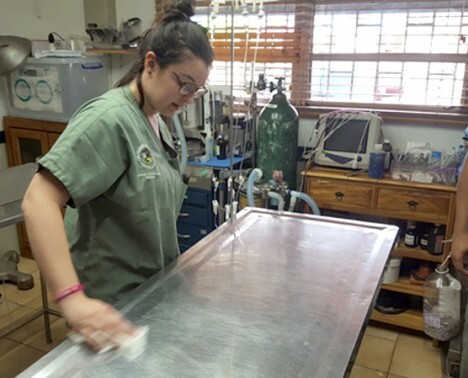 I went on a project in Aruba, I am 17 years old and currently studying animal management at Kirklees College. During the project, we did work at the donkey sanctuary, dog groomers and the vets. At the sanctuary we poo picked, fed hay and pellets and interacted with tourists by telling them about the donkeys. In my free time I went to the beach, did water sports, went snorkeling and went horse riding. Thanks to Erasmus+, personally I learned how to prepare and look after animals before and after surgery. Personally, I think the project has helped me become more confident around animals and has given me the opportunity to meet people of different backgrounds and cultures. My name is Nicole Manning, i’m 17 years old studying at Kirklees College. 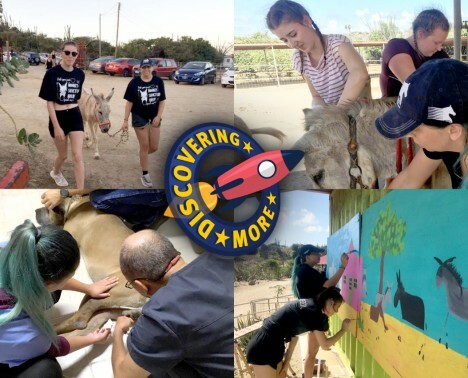 I went on a project in Aruba to work in a donkey sanctuary, vets and dog groomers. During the 2 weeks, I worked in a donkey sanctuary which helped me learn about animals i would not usually work with. We did basic husbandry and, worked in a vets which was an amazing experience. I was able to inject a cat with antibiotics. I really enjoyed this work as I would never have the chance to do this. During my free time, we went snorkelling which was my favourite activity. Thanks to Erasmus+, professionally i learned how to treat donkeys with severe ear conditions. Personally, I feel this experience has increased my confidence. Our latest Vocational Educational Training (VET) project ‘Moving Feet Opening Minds’, may have come to an end, but the effort from participants to spread the word about it, is still going. Our partners from Askham Bryan College have just sent us pictures of an exhibition developed and held by some participants who took part in a VET project in Aruba. During their project they developed skills in animal management. 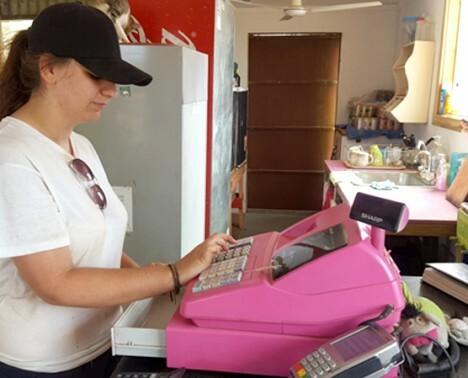 As part of their Vocational Educational Training project in Aruba, two vocational trainees created a guide explaining “How to prepare the visitor centre at the aruba donkey sanctuary”. 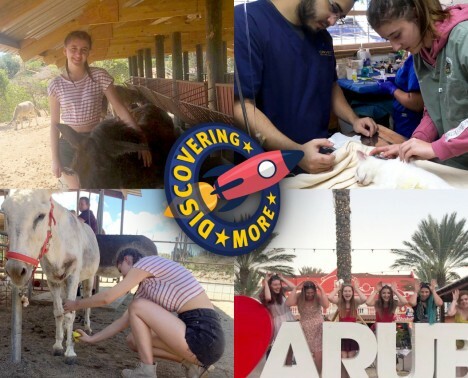 This project is part of A Different Kettle of Fish, supported by the Aruba Donkey Sanctuary and Askham Bryan College and funded by the Erasmus+ programme of the European Union. This project guide has been created by Rebecca Hewick and Jessica Watson . 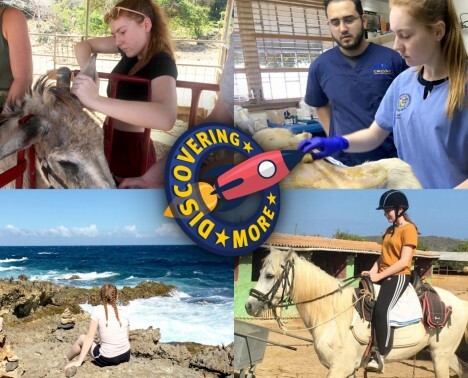 Two trainees from Askham Bryan College, who went to the Vocational Educational Training (VET) in Aruba produced a guide about the project at their return. This guide explains “How to prepare an animal for a veterinary procedure”. This project guide has been created by Rowan Halligan and Neve Bray. 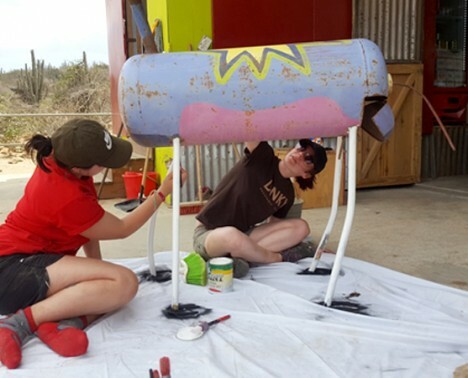 As part of their Vocational Educational Training project in Aruba, two vocational trainees created a guide explaining “How to complete a husbandry routine and general maintenance at the aruba donkey sanctuary”. 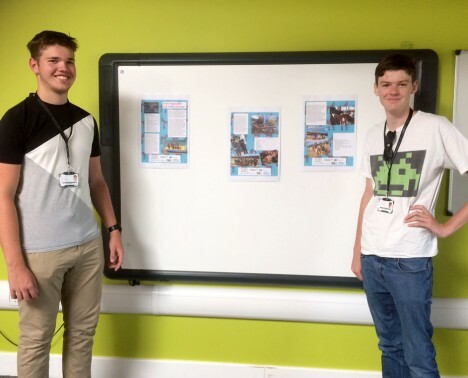 This project guide has been created by Rebecca Hawkins and Casey Wilson.